I bought my first car at age 22. I had accepted a summer job waitressing at a golf course on the coast, which was a 45 minute drive away from home and not on any transit routes… and I had no way of getting to work. So OBVIOUSLY, I had to buy a car in order to get to my place of employment, where I would undoubtedly earn far less than the cost of the car. Financial planning at its best, folks. If only it ended there. I arbitrarily set myself a budget for the car purchase – hilarious, as I had zero savings and very little earning capacity – and went car shopping. I found my Echo at a rental car company’s used car sales lot, where they sold off their rental cars that were no longer part of the fleet. Echo was 2 years old, in really good shape, and the cheapest car for sale there – $4000 over my budget. I test drove her. My dad tried to talk some sense into me, but geez, Dad, don’t try to confuse me with facts. “But she’s so CUTE!!! !” I brought her home a few days later, along with a poorly researched car loan with a horrible interest rate that I was stuck with for the next five years and could barely afford. Then I proceeded to quit my job. I… can’t even talk about it. I’ve kept my Echo for the last eleven years. We had a happy partnership for the first several, and I felt determined to keep her for a long time after the unwise car loan was finally paid off, to make it “worthwhile”. I’ve had to pay very little into car maintenance over the years. We’ve driven across Canada in each direction… all the way from Vancouver to Montreal and back, spending one school year in Ontario in between the trips. (That winter in Ontario, with all the salt on the roads, is responsible for Echo’s affectionate nickname, Rustbucket). I slept in my car a couple of nights along the way to save money, I’ve been camping with Echo, we’ve had dance parties at top volume while driving up to Whistler. I know her. About five years ago, I started thinking of Rustbucket (who had well & truly earned her nickname by that point) as more embarrassing than fun. I began dreaming of replacing her with a Mazda 3 hatchback… but then I got laid off. I went travelling, where I spent all my savings, and came home to an economic crash and a tanked job market. I got hired finally after a year of unemployment, only to be laid off again 9 months later. Followed by a rather difficult foray into self-employment that yet again wiped out all my savings. Mine was a tough road to walk between 2008-2011, friends. Upgrading my car was the least of my concerns. But finally, finally, things have been a bit easier over the last year and a half. That’s when I created a savings plan toward the goal of buying a Mazda 3 hatchback, and was planning on making the purchase next year. But in the end, Echo made the decision for me. She’s spent a lot of time at the mechanic and nobody knows what the problem is, but she became virtually undriveable in the last month. I could spend a bunch of money to diagnose and correct the problem and keep her running for a few more months, but what’s the point? Last weekend was it. I went car shopping and pulled the plug on Echo once and for all. Meet her successor, Magdalena. The car of my dreams for the last five years. 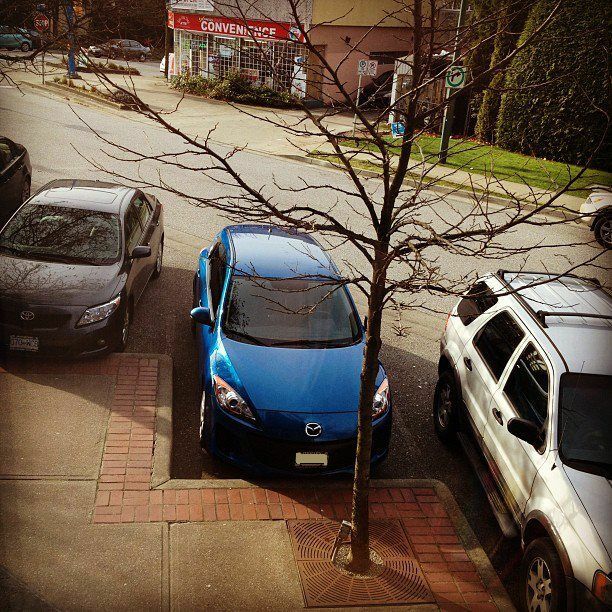 My metallic blue 2012 Mazda 3 hatchback… FINALLY! This entry was posted in Life and tagged car shopping, driving, mazda 3 hatchback, mechanic, toyota echo on March 22, 2013 by A Little Coffee.